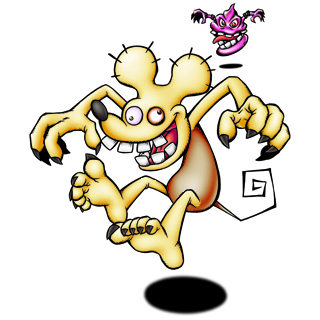 A crazy mouse-like Digimon who always tell Sukamon lies. 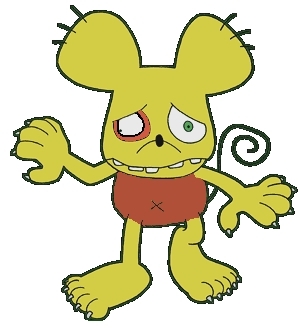 His strong friendship with Sukamon came to be when Sukamon happen to come along to the place where he was caught in a trap set by an network cannibal and rescue him. He is basically a coward, before his naughty wisdom is unmatched, but he runs away when it becomes dangerous. 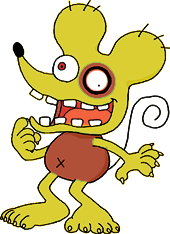 His special technique is "Cheese Bomb" where he throws a cheese shaped bomb. When it is eaten by mistake, it becomes something unusual. Those who eat them by mistake regret it afterwards. Origin / Japanese. Chuu is short for Chuuchuu, which is the sound that mice make. Origin / Japanese. 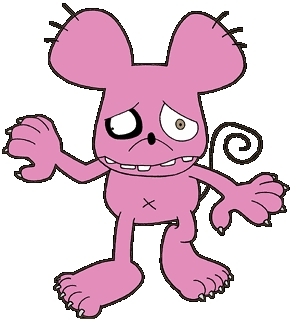 Tyu is a Nihon-shiki romanization of 「チュ」, from tyūtyū (「チューチュー」), onomatopoeia for the sound mice make.